Originally appeared at Kopp Verlag in German. Translated by David Norris. Edited by Kristina A.
Europe is a "bridgehead for America" to control the Eurasian landmass that runs eastward through Russia and China to the Pacific. A "moral identity crisis has weakened Europe's vitality". And this sentence: "The new problems facing Europe, whether this is immigration, or the economic-technological ability to compete with America or Asia ...can only be dealt with in an increasingly continental context." These three sentences are not to be read in any of the leading mainstream newspapers in Germany, because in the propaganda language of our key media outlets these contentions are no more than "conspiracy theories". Yes, they equate to "right-wing populism". However, they come from the grey eminence among US foreign policy strategists: Zbigniew Brzeziński. He was adviser to Lyndon B. Johnson in the 60s, later also to Jimmy Carter. And he is Barack Obama’s most important geopolitical adviser. What Brzeziński says, not only carries great weight, but all the most important ears in the US Congress and the White House listen to him. His analyses have found their way into the most important foreign policy screenplays in the USA ― again and again. For this reason what Brzeziński wrote in his book The Grand Chessboard. American Primacy and its Geostrategic Imperatives published in 1997 is even more astounding. 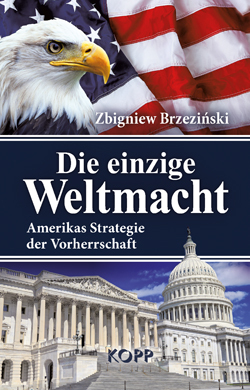 The book is now available in German with the title "Die einzige Weltmacht – Amerikas Strategie der Vorherrschaft" and is published by Kopp Verlag. NATO’s eastward expansion, the proxy war in the Ukraine, the US incitement of the Europeans against Russia including sanctions, the present stream of immigrants to Germany and the attacks of the IS Islamists against European towns. The growing influence of Washington over an increasingly centralised Europe, in order that Russia and China can be kept in check; strong influence over their German vassals, so that the unification process of the EU does not stall, because "the German view of a European order would take on more nationalistic tendencies"; Europe expanding eastward to build "a springboard for democracy", that is "of direct relevance to the security of America". In this respect the USA looks upon the Europeans as an economically emaciated continent that acts with "indifference" and "spiritual emptiness", in contrast to agile America, that is working with every means possible worldwide in the "spread of democratic principles". Brzeziński expressed the fear 18 years ago in a premonition, that this "culturally lethargic Europe" of "nationalistic extremists or dogmatic ideologues" could be exploited for these purposes. Had the Islamic State then existed Brzeziński would certainly not have left them out. Those extremists named by him are now religiously motivated terrorists; the eastward expansion of the EU and NATO has since then encompassed Poland, the Czech Republic, Hungary, Bulgaria, Estonia, Latvia, Lithuania, Romania, Slovakia and Slovenia; and Ukraine, in line with the Brzeziński prognosis, has proved to be the key project to date in the US and NATO policy toward the East. I know of no other book, which so openly and unsparingly reveals American motives, plans and assessments on how to handle Europe. Whoever still wonders, who or what is putting Angela Merkel under so much pressure with her outwardly completely chaotic, but in truth strict immigration policy, should read this extremely revealing book. This also goes for the American primal fear of failure of these plans: to set up and deploy a united Europe as a more controllable block vis-à-vis the new geopolitical rivals Russia and China. In the event of failure of these "efforts", Brzeziński, in the decade before last, already foresaw "the new version of some quite traditional chicanery". What he has in mind is that Germany and Russia would give free expression to their "geopolitical craving for recognition", as Brzeziński formulates it. At the moment Russia is paying dearly for not allowing itself to be leashed. And Germany is paying even more dearly by throwing away a part of her wealth to feed the economically ailing southern periphery in the absence of political solutions and by trying to cope with the flow of refugees to Europe virtually alone, because most of her neighbours have erected fences or simply refuse to accept the agreed refugee quota ― or both. The book is enthralling and written with an explicitness that one could not even dream of from the mouth of a leading German politician. It is prophetic, revealing, without scruple in its openness and is destined for the top row on domestic bookshelves on account of its topicality and foresight. If anyone has ever doubted that the political caste in Berlin, up to and including the Greens, are on the US leash, they will receive here an unsparing and open confirmation of it from someone involved in the construction of the leash.